In this article, we are going to discuss Motorola Wireless Fence 25 review. We have also a great writing based on top 5 wireless dog fence reviews. To get comparison among top 5 wireless dog fence, visit this page – Best wireless dog fence. Every dog owner will agree that it is very stressful to look for their dog when he strays away from their compound. It is stressful because the dog can get too far that it may require a number of days to locate him. Since you cannot watch your dog all day, you need to have a fencing system that works well in confining your dog in a certain space where you can see him. Wire fences are great but sometimes, the dogs can easily pass through some of the gaps if it is not well made which can be a problem. It is also not very advantageous for when you want to travel with your dog. However, if you have a wireless fence system for your dog, you will have an easy time keeping them close to you to avoid the stress of tracing them when they wander off. Motorola WIRELESS FENCE 25 is one of the best fence systems you can get for your dog. Whom is Motorola Wireless Fence 25 Suitable for? Dog owners who have 1 or 2 dogs and willing to confine his/her dog in the Yard. First and foremost, this wireless fence system has a total of 15 stimulation levels. There are low levels and high levels. You get to choose one that suits your dog’s temperament. The higher levels are normally used for dogs that are difficult and stubborn and very hard to train. It is therefore important to understand your dog first before you choose a certain stimulation to use on them. This will make it less confusing for the dog. 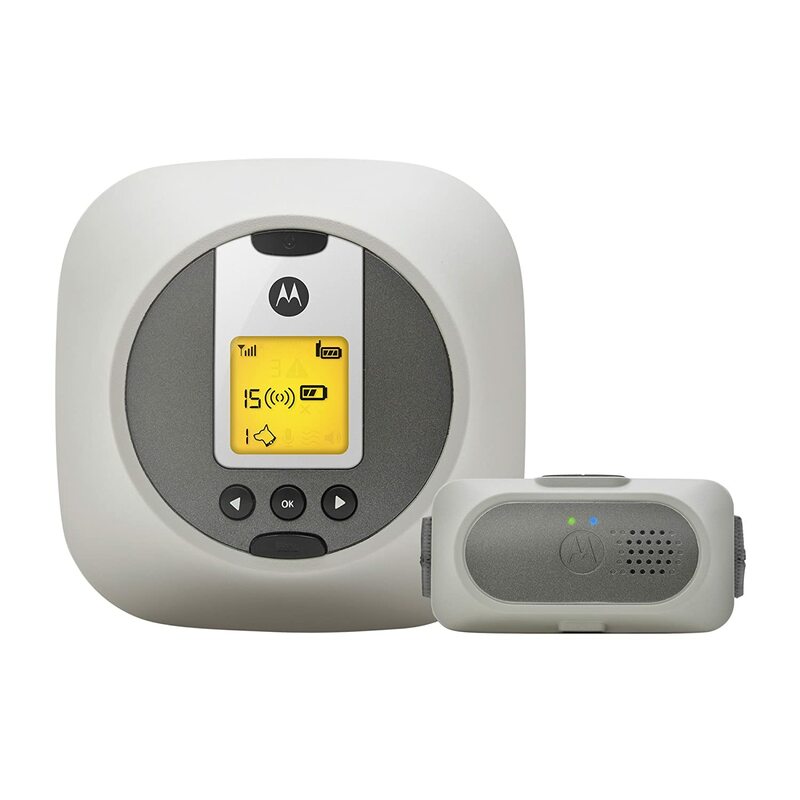 The other thing you get from the Motorola WIRELESS FENCE 25 is the collar unit for the pet. This is a very important feature because it is the one which makes it possible for you to send the stimulation to the dog. There is a direct connection between the system and the collar which makes this possible. The great thing about this pet collar unit is the fact that it is suitable for dogs weighing up to 20lbs. The wireless fence system operates on a battery that is rechargeable. This is very important especially when you are out traveling. You can choose to have a spare battery or carry the charger to ensure the fence system’s battery is fully charged at all time. This makes work easier for you. This added to the fact that it is not difficult to use makes it very convenient for a person who has not used a similar device before. The other amazing thing about this unit is the fact that it has an LCD screen that is backlit. This has a very important feature because you might find yourself in a situation where you might need to use the unit at night. With the backlit LCD screen, you are able to operate it with ease. This is something that enables you to ensure your dog is safe throughout the day whether you are at home or out. This unit also comes with a wireless transmitter. This is responsible for making the boundary that prevents your dog from leaving the backyard or wherever you want them confined. The advantage of this boundary is the fact that it does not require maintenance and it is very easy to put in place. You therefore get to enjoy an easy time training and keeping your dog safe. The collar unit of this wireless fence system is water resistant. This is something that can be difficult to get in other types of wireless fences in the market. This is a feature that enables you to take your dog to the beach or anywhere else they are likely to get into water without worrying about injuries or the dog wandering off. This is one of the things most people love about it. With this wireless fence, you get to enjoy two modes of training. There is one that only produces a sound and there is another that produces stimulation when the dog tries to leave the boundary. This is very important for training. It enables you to train the obedient dogs without any stimulation and the stubborn dogs can get some stimulation in order to get obedient. It is great for puppies as well. Last but not least, this fence unit has the collar unit is very light in weight. This is a very important feature because it ensures your dog is comfortable as he plays and even when you are training him. This is very important for puppies because discomfort can discourage them from playing and moving around which is important for a dog. This is another feature that is not easy to come by. In conclusion, Motorola WIRELESS FENCE 25 is a great way to keep your dog safe whether you are at home, at a friend’s house or travelling. This makes things easier and fun for you. It is also a great way to train your dog and it is comfortable for the dog as well. It is a great product that every dog owner ought to have.